LOGAN, UTAH — Campbell Scientific, a maker of research-grade measurement instruments for over 40 years, is releasing an innovative new data-acquisition product: the CR300 measurement and control datalogger. The CR300 has many of the best capabilities of full-size Campbell Scientific dataloggers, with the smaller size and price of Campbell’s compact dataloggers. 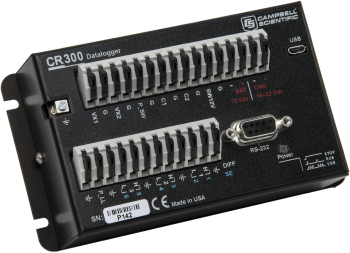 The CR300 datalogger was developed based on customer feedback, especially from customers who embed Campbell Scientific dataloggers in their own products. It is a step up from Campbell’s earlier low-cost, compact dataloggers because of its much richer CRBasic command set and serial communication capabilities, and its capacity for larger, more complex programs. The CR300 also has its own onboard compiler that can handle large, complex programs. The CR300 is the same size as the earlier compact Campbell Scientific dataloggers, so it can be a drop-in replacement. It is also the first Campbell datalogger that can measure 4 to 20 mA sensors natively. The CR300 is the best-value datalogger Campbell Scientific has ever built. It has a 24-bit analog to digital converter, a high-speed processor, and a micro-USB port. For communication, the CR300 has full PakBus capability, making it an important part of your network. There is plenty of non-volatile flash memory for storage. The CR300 is programmed with Campbell Scientific’s LoggerNet software, which includes a point-and-click program generator, and a network planner for graphical layout of devices.